I posted this suggestion to another post, but thought it would be worth its own separate feature request. 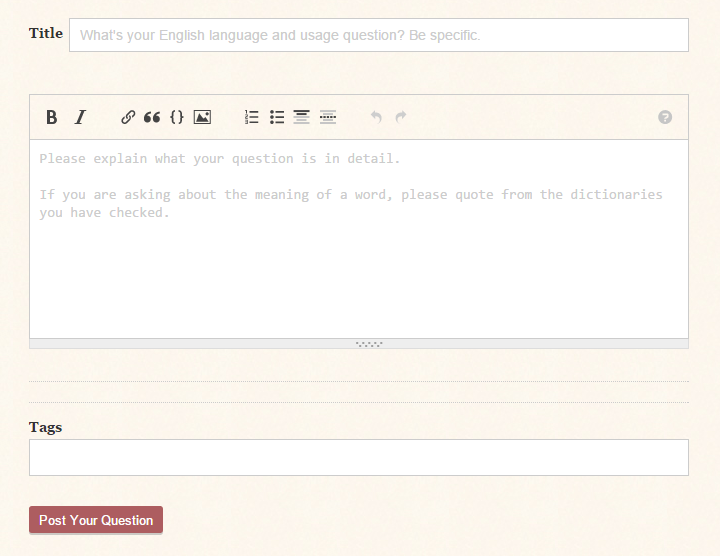 Is it already possible to add a placeholder text to the question body box, or would the SE developers be able to add this functionality? If so, we can then discuss what the text should be. This placeholder text might be seen by more people who just ignore the side bar. Yes, I love this idea. SE Devs should definitely add it. Quick and easy, and should be harder to ignore than the "How to ask" (which is off to the side). Not the answer you're looking for? Browse other questions tagged feature-request design asking-questions .